The biggest challenge of fencing on hilly terrain is sagging. Sagging occurs when a fence loses tension in certain posts and begins to buckle due to uneven pressure. Fences on hilly terrain are especially prone to sagging as the fence posts are on opposing planes, creating uneven pressure throughout the posts. To relieve this uneven pressure, we recommend installing fence with a Square Deal knot. The knot’s shape is designed to provide extra strength with flexibility. This pliancy allows the fence to automatically relieve high-pressure areas while remaining rigid in low-pressure areas. In addition, the smooth side of the knot prevents injury to your animals’ hides. 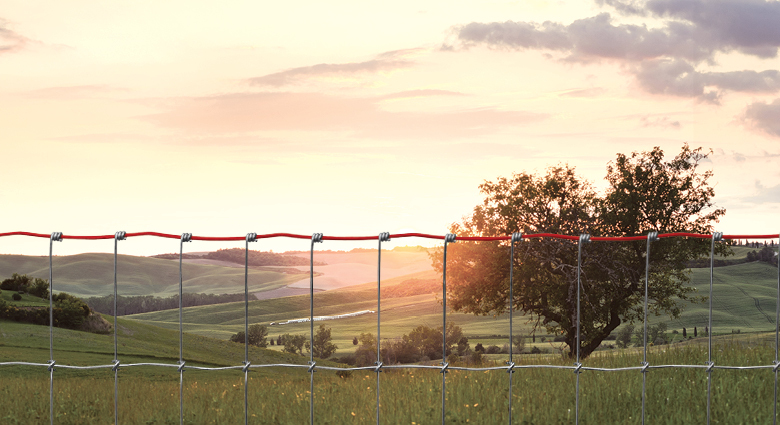 Red Brand offers several fence styles featuring the Square Deal knot, including Field Fence, Non-Climb Horse Fence, Sheep & Goat Fence, and Yard, Garden & Kennel Fence. Choosing the Square Deal knot is a great start to ensuring a safe and secure fence on hilly terrain, but there are other steps you can take, too. Select a fence with the largest spacing you can safely allow for your animals. Narrow vertical wire spacing results in more wires throughout the fence, increasing the potential for uneven pressure. A second tip is to install a post at every peak and valley to improve stability. While most fences require posts every 8 to 12 feet, a fence on hilly terrain may require more frequent placements. When tying off on the corner post, be sure to adjust the angle of the fence to the slope of the terrain. This will allow proper tension on all the horizontal line wires. Here’s a quick video that demonstrates the process. Finally, before making your fence selection, talk with your local Red Brand dealer to ensure that the fence you purchase features the Square Deal knot and has the largest vertical spacing appropriate for your application. Furthermore, discuss where you should place your fence posts for proper support. When you follow these tips, you’ll feel more confident that your animals are safe and secure, even on hilly terrain. For more information on Red Brand fence products visit our website.